I was recently going through the new vSphere 5 API reference guide and I had stumbled across two new interesting virtual machine features that I did not see any mention of in the vSphere 5 beta documentation. The first feature is the support for a new e1000e virtual ethernet adapter which provides support for PCI-Express adapters. This is a new virtual device type that has been added in vSphere 5 and is only supported on virtual machines running on Virtual Hardware 8. The interesting caveat about this feature is that it is not available as an option through the vSphere Client when adding a virtual network adapter to a virtual machine. You only have the option of pcnet,vmxnet2,vmxnet3 or e1000 but not the new e1000e. Since the feature is in the vSphere API, I updated an old vSphere SDK for Perl script called vmNICManagement.pl to support the update of an existing virtual network adapter to an e1000e. 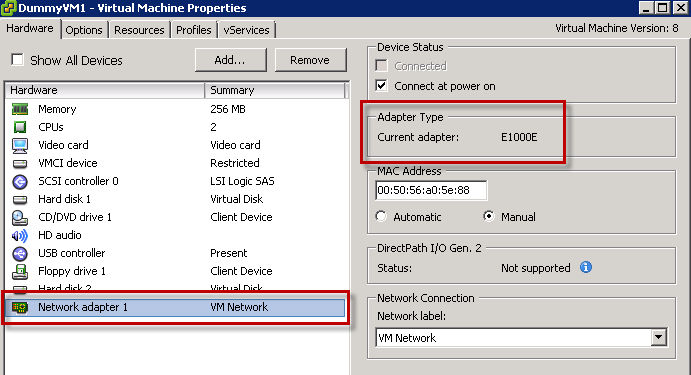 Here is an example of a VM that is running Virtual Hardware 8 with a normal e1000 virtual network adapter which we will then convert into an e1000e adapter. 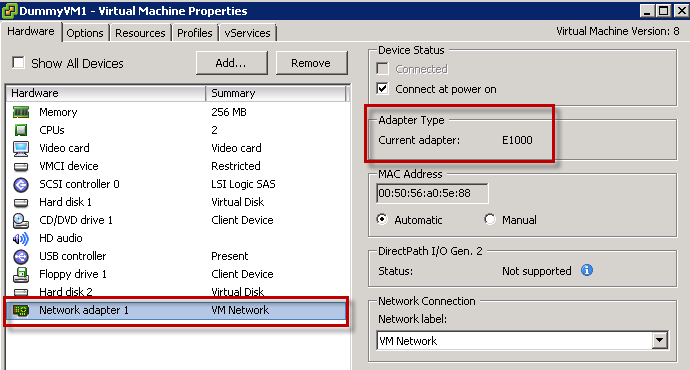 Once the virtual network adapter has been updated, you can view the virtual machine's settings once again and you will see the new e1000e adapter. The second feature is the ability configure the boot device order for a virtual machine which is available through the vSphere API but not through the vSphere Client. This feature does not actually change the BIOS boot order device but provides the ability to create an ordered list of preferred boot order devices. Once this list has been exhausted, then it will default to the BIOS list of boot order devices. This feature also requires the virtual machine to be running Virtual Hardware 8. When viewing the configurations of a virtual machine using the vSphere Client, you have a few options to configure when it comes to the "Boot Options". The only new feature from vSphere 5 that has been exposed in the vSphere Client is the ability to select boot firmware which now includes EFI support. No where in the vSphere Client is there an option to control the boot device order. The only way to view this new feature is using the vSphere API and using the vSphere MOB we can see that by default this feature is not enabled/configured. I of course decided to write a simple vSphere SDK for Perl script called updateVMBootOrder.pl which allows you to configure a list of preferred boot devices. The options support cdrom, floppy, hard disk and virtual nic and the last two also require specifying the specific hard disk or virtual nic as a virtual machine can be configured with several. The script supports a "list" operation which will query an existing virtual machine to check whether boot options have been configured, if so, they will be listed in order they were defined in. 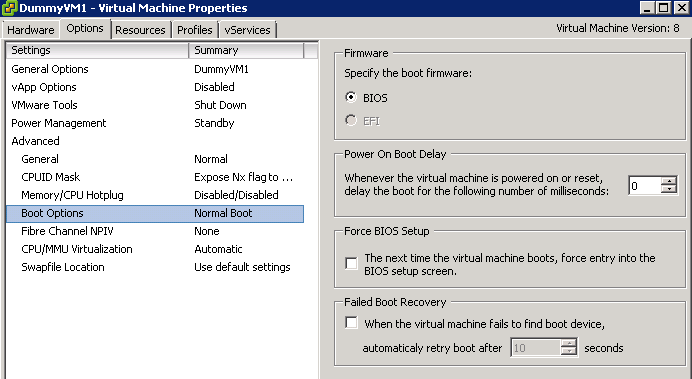 We have confirmed that no boot options have been configured for this VM. If you decide to select a hard disk or virtual network adapter, you will need to run some additional queries to identify the "deviceKey" which is used to identify a particular virtual device. If you select cdrom or floppy, then these additional steps are not necessary. To view the virtual network adapter device keys, you will need to run the "listnic" operation. To view the hard disk device keys, you will need to run the "listdisk" operation. You will need to use the "update" operation and then specify the devices and their order using --bootorder flag and also the respective --nickey and --diskkey. If we now re-run the "list" operation, we will see the configured boot devices for this virtual machine. We can also verify by checking the vSphere MOB for this particular virtual machine and the bootOptions parameter should now be populated. As you can see it pays off to poke around in the vSphere API reference documentation 😀 You should try it sometime! Thanks for this info, I recently installed a 5.1 vmware on a intel 5500bc motherboard with a intel 10gig dual port lan card. As you have rightly said, even though i see the 10g network adapter on the network adapters console, i do not see the e100e when installing the guest. 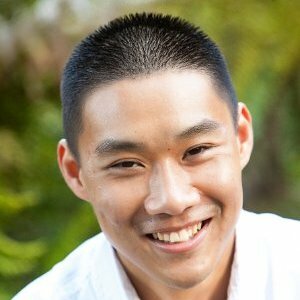 Can you please do help me out as to how to install your script in the vmware using cli and also where can i download your perl script ? Is there a sample perl script available in the vmware-vsphere-cli distribution that can find all the un-attached VMDKs on a vmware cluster? I am having issues at 6.0 esxi when trying to set my ethernet card as the first boot device. Thoughts? 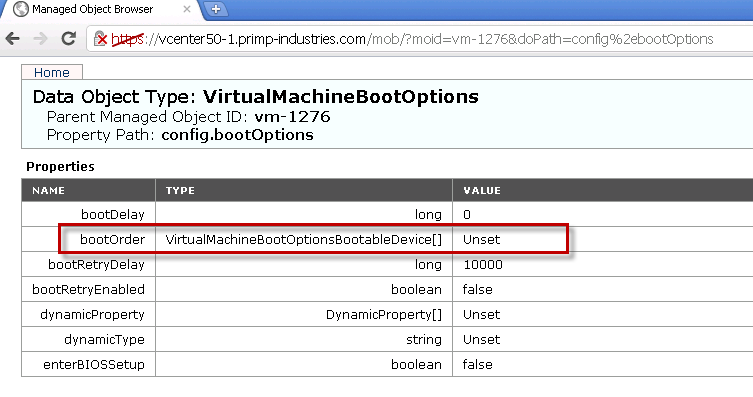 Can’t locate object method “new” via package “VirtualMachineBootOptionsBootableEthernetDevice” (perhaps you forgot to load “VirtualMachineBootOptionsBootableEthernetDevice”?) at updateVMBootOrder.pl line 86.